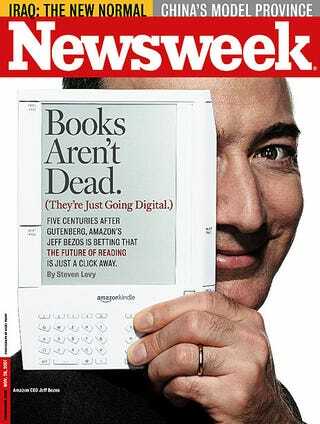 Amazon Kindle Official Details: $399, "Whispernet" EV-DO, the "iPod of Reading"
There's a lot to digest in Newsweek's seven-page all-out feature. Amazon CEO Jeff Bezos sums it up: "This isn't a device, it's a service." Kindle starts shipping tomorrow for $399 and is "a perpetually connected Internet device" running off of EV-DO—it calls the service "Whispernet." It's totally computer independent: You browse for books (88,000 at launch) and buy them in a "one-touch process," it comes with a personal Kindle email address and it can browse the regular internet—keyboard sounds useful now, doesn't it? New York Times bestsellers and hardback new releases will go for $9.99, with classics going as low as $1.99. Through the service, which is an extension of the Amazon store, you also can subscribe to newspapers (New York Times, Wall Street Journal, Washington Post) and magazines, which are automatically sent to Kindle when they drop on the wire. Talking about the hardware itself, it'll hold 200 books on board, though you can supplement with unspecified memory cards. It'll get up to 30 hours of reading per charge and weighs 10.3 ounces. So, why does such a potentially disruptive device look so very plain? They wanted it to look like "an austere vessel of culture." The moniker Kindle is from the same line of thinking, "the crackling ignition of knowledge." But, thankfully, it doesn't get warm itself. Some obvious questions are left though, mostly about the "always-on" connection—is the EV-DO-based Whispernet service included in the $399? If not, what's the pricing on that? And what are its limits, since you can go out onto the real web? Odds are, Bezos himself will reveal the answers tomorrow.